“Standing out from the crises” is the most remarkable feeling in these two years. Two years passed quickly, somehow I have a deeper understanding about my friend, Hong Kong. Tung Chung, Tin Shui Wai, Mongkok… Touring in the communities, we know about Hong Kong in a more concrete and meticulous way. If opportunity arises when there is crisis, every time when SDU-Special Divine Unit (SDU) departed for the crises in Hong Kong is an excellent opportunity for the SDU participants to care more and know more about this city. In the past two years, we have organised five SDU preparation courses. In total we have trained 450 volunteers (church followers and leaders) to become members of the SDU. There are 21 sub-districts which have set up SDU squads out of the 64 sub-districts. They serve the communities in response to different crises. Among the crisis incidents in which we have helped, the massive fire outbreak in Fa Yuen Street in December 2011, the Lamma Island shipwreck in October 2012 in particular have mobilised hundreds of trained SDU members. We have practically brought the objective of our Program “Standing out from the crises” into life. 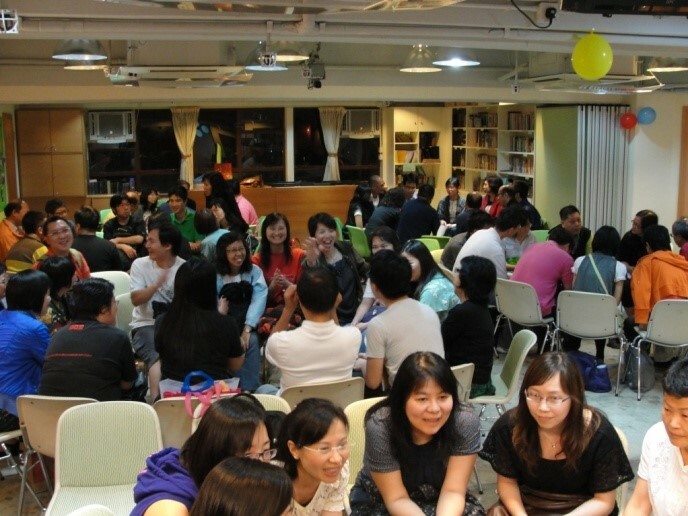 The Program is to encourage church fellows in Hong Kong, through different networking, to be prepared and trained to care about people in crises. Participants of this Program attended courses and practicum trainings in about 9 months. They learnt about the basic knowledge of crises, community resources that can assist people in crises and basic counselling techniques. Combining practice and knowledge and experience, the participants understand and experience in person the meaning and importance to be a member of the SDU. In these two years, we had 24 operations in response to the following crises : Fire outbreak at Ma Tau Wai Road, Jump at Fa Hui Road, Family Violence at Cheung Hang Estate in Tsing Yi, Fire outbreak at Parkes Street, Fire outbreak at Fa Yuen Street, Fire outbreak at Wah Fu Estate, Jump in Yat Tung Estate, Family Violence in Sau Mau Ping Estate, Jump in Ting Ping Estate, Traffic Collision at Chai Wan Road, Lamma Island shipwreck, Jump in Hau Tak Estate, Fire outbreak at Chung Hing Mansion in Quarry Bay, Fire outbreak in Kwong Yuen Estate, Fire outbreak in Hau Tak Estate and a few family violence and murder cases in Hong Kong. We helped the residents and companies who had been indirectly or directly affected by the crises, around 2,000 people/households. The happiest and most encouraging thing was that there were at least two sub-districts (West Tsuen Wan and Tung Chung Yat Tung Estate) which had set up very well-organised SDU Teams during these two years. These teams have become independent and took the initiatives to support different crises in the respective communities. After the completion of this Program in March 2013, SDU Teams have been set up in 10 squads to continuously look after the communities. On top of that, there are at least 4 churches and local social services organisations networked. 3 churches stood up to give consultation to residents who are in need. In a word, this Program has enhanced the relationship of the churches and connection with community resources, and provided opportunities for participants to know more about crises and how to respond to crises at the same time. More importantly, this Project has created a platform for the community to express their compassion and love to people in need. Even though responding to crises are never-ending, as long as we are willing to stand up and everyone tries our best, then things get accomplished! Thanks to Fu Tak Iam Foundation Limited, its support has made this 2-year Program happen and develop, and helped and blessed those people in need. A family violence happened in Sau Mau Ping Estate on 6 May 2012. Our SDU and the Church in the same district paid a visit to express concern for the people at the neighbouring areas including the residents of the building and the security staff. This time our SDU at East Kowloon was responsible for planning and leading the work. During the operation, there were tears for the residents and volunteers themselves. Among the volunteers, 4 were triggered with their past unhappy experience. However, with support from their faith and groups, they had recovered from their unhappy experience and moved towards a free life! Early in the morning on 30 November 2011, a level-4 alarm fire broke out at the hawkers’ stalls in Fa Yuen Street in Mongkok. The fire rapidly spread to two tenements nearby. 9 people were killed and 34 people were injured. It was the highest number of casualties of fire outbreak ever in Hong Kong since 1997. We swiftly responded to this crisis by sending the SDU Team to the temporary shelter to pacify the affected families. 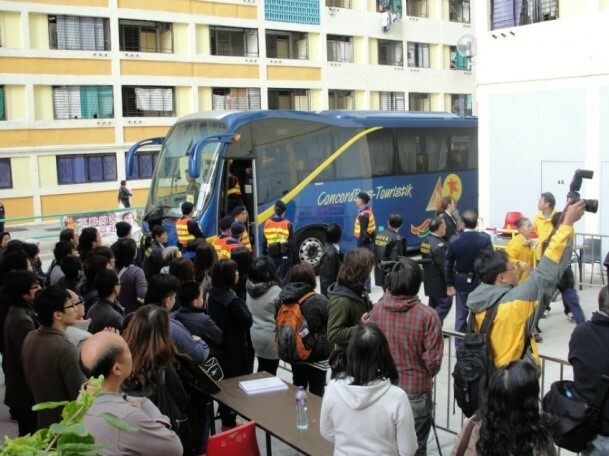 After 3 days, 20 SDU team members and 65 church voluntary workers went to the Interim Houses in Shek Lei Estate and helped to set up the accommodation and prepared the basic necessities for the victims to move in on the following day. On the next day, 85 SDU team members and 90 church voluntary workers visited the Interim Houses to welcome and convey concern for the victims, and sang songs of blessings. 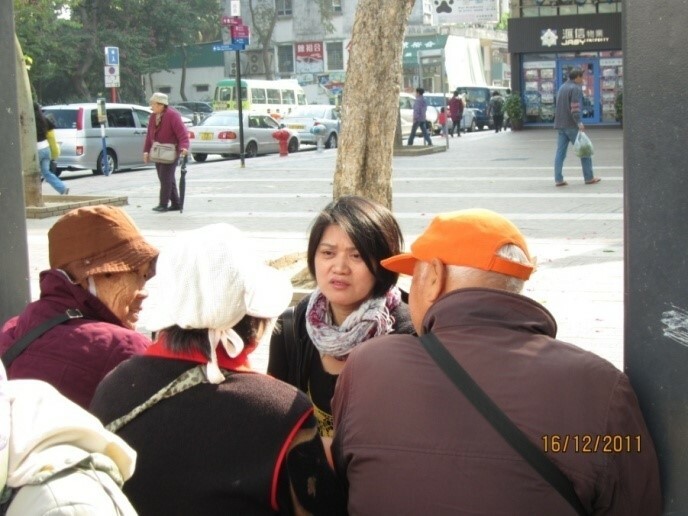 Some of the voluntary workers who were more familiar with Shek Lei introduced the place to the victims. And some others even helped the victims to tidy and clean. Responding to crises needs to be done within the golden 72 hours after the crises had happened. Our quick response has spiritually and practically help the victims as much as possible. Overcoming crises is a process. SDU hopes to let the victims know there is someone who stands by them, listens and wholeheartedly responds to them at the most crucial moment; so as to relieve their worries and fears. We all feel sorry to hear about the casualties of the Fa Yuen Street fire outbreak. Even though we might not personally know the victims and their families, we do wish they can overcome and recover from this crisis very soon. We live in a very busy city here in Hong Kong, and this makes caring for each other even more necessary. Jesus Christ teaches us to “love your neighbours as yourselves”, but it is really not easy to do it. As Christians, we are grateful to have put this into practice during this operation. Recalling that day when we went to Shek Lei Estate, I just thought I would help on whatever I was needed. And there were many voluntary workers from various churches waiting to be assigned for duties. We appreciated it that the co-workers from Ladder Mission had already contacted the government departments and social service organisations to make necessary coordination in advance. This gave us peace of mind and helped us focus on how to care about those victims without worrying about the administrative procedures. On that day, I was in the same team with Ah Ching. 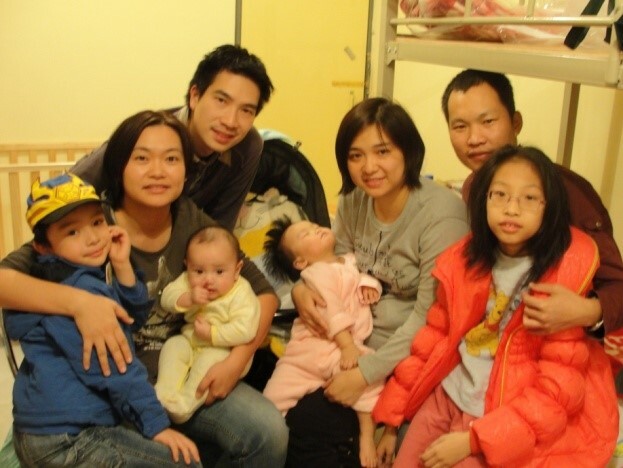 Our tasks were to assist Grandma Lam to adapt to her new home within several hours and give appropriate support to her. I believe Jesus was guiding us, otherwise we wouldn’t have understood Grandma Lam’s feeling and needs within such a short period of time. Thanks to those who had sent in supplies to the victims; people from all kinds of backgrounds, government departments, social service organisations and management companies… We have all put this “love your neighbours as yourselves” into practice. Let’s bless our communities and share a bit more love everyday!